Toronto, Canada (March 19, 2019) – Pledging to support the retrieval and recycling of used vehicle batteries from hundreds of remote communities across Canada, the U.S.-based nonprofit Responsible Battery Coalition (RBC) and the Canadian Battery Association (CBA) recently met with First Nations representatives in northern Manitoba to join forces in managing used vehicle batteries in an environmentally responsible manner. The initiative brings together the RBC’s 2 Million Battery Challenge and CBA’s battery Stewardship program, and was formalized in a Memorandum of Understanding between the two organizations. Eleven First Nations communities from Manitoba signed commitments to participate in the joint program. The RBC is a coalition of companies, academics and organizations committed to the responsible management of the batteries of today and tomorrow. RBC created and sponsors the 2 Million Battery Challenge, a program designed retrieve and recycle two million used vehicle batteries. The CBA represents the Canadian lead-acid battery industry, and has been actively promoting stewardship of lead-acid batteries in Canada since 2010. CBA Executive Director Colin McKean said he was pleased to join forces with RBC and expand his organization’s ability to support First Nations communities in responsible vehicle battery management. “With 63 First Nations in Manitoba alone, we believe there are potentially tens of thousands of used vehicle batteries in these communities that need to be isolated from the environment and transported to recycling centers,” McKean said. Since 2010, CBA has retrieved and recycled approximately 2.6 million vehicle batteries in Manitoba. McKean noted that collecting and removing batteries from remote communities is challenging due to the long winter season, minimal road access to some communities, and only winter road access to many. Christensen said the RBC and CBA will begin working together immediately to support and expand CBA’s existing battery retrieval and recycling program. • A level-playing field and a “Free Market” for lead-acid batteries. Photo captions: RBC, CBA and leaders from 11 First Nations communities from Manitoba celebrate the joint effort to retrieve and recycle used vehicle batteries from remote Canadian communities. 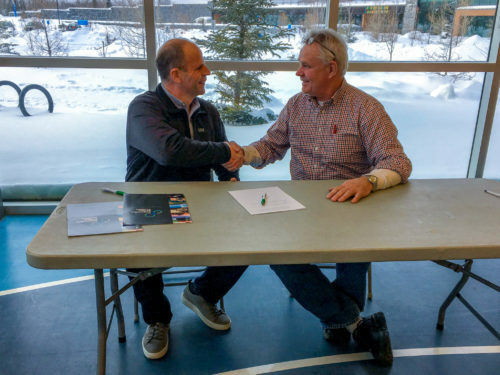 RBC Executive Director Steve Christensen (left) shakes hands with CBA Executive Director Colin McKean after signing MOU.